KAKHIN BIMILE, Bangladesh — Kismat Ali is a 33-year-old mason living in Kakhin Bimile, a village a few hours drive from Dhaka, Bangladesh’s crowded capital. He lives in a large brick home on a dirt road with his wife, son, parents and five brothers. This semirural area is off the main electrical grid, so residents rely on kerosene lamps and electricity from wires strung across the village to a noisy privately owned diesel generator. It runs about five hours each night. But Mr. Ali has a new source of electricity he can turn to: solar panels on his corrugated metal roof. In his home, he flicks a light switch and a bare bulb glows from the ceiling. Mr. Ali proudly switches on a fan that stirs the stultifying summer air. He says he wants to have a television one day, but is waiting for an LED TV that would consume less energy than models available now. Solar energy is reliable, clean and cheaper in the long run than kerosene and the village’s generator. It costs about 3,000 taka ($38) a month for the diesel generator to light a three-room house. But for the solar equipment, Mr. Ali pays 1,355 taka ($17) in monthly installments after a down payment of 6,500 taka ($83) on a loan he expects to pay off within two years. 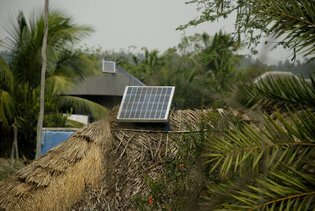 In rural Bangladesh, especially the coastal southwest, it is common to see tiny solar panels embedded even in humble thatch-roofed huts. This is mostly the work of Infrastructure Development Company Limited (Idcol), a government-backed Bangladeshi energy and infrastructure group that claims more than 90 percent of the country’s booming home solar market. Since 2003, Idcol has installed solar panels in 3.95 million off-grid homes, reaching 18 million people. In terms of individual units served (rather than total wattage), Bangladesh has become one of the world’s largest markets for home solar systems. By comparison, Selco, a leading solar company in neighboring India, has installed about 350,000 home systems since 1995 in a country of 1.2 billion people. In the United States, even after exponential growth in solar in recent years, there were just 784,000 home and business solar installationsin 2015. One factor in those comparisons is that solar energy has become a lifeline for low-income Bangladeshis, a great many of whom the grid does not reach. Although its big cities seem bright and bustling, just 25 percent of the population of 160 million have reliable electricity. Since electricity — even in small doses — powers lamps, cellphones, fans, water pumps, health clinics and equipment for businesses, it is critical in improving the lives of the poor. Solar is also safer and cleaner than conventional fuel. Idcol estimates that each year its solar installations replace 242 tons of kerosene worth $300 million that the poor would otherwise spend on lighting. The keys to Idcol’s expansion across Bangladesh are financing plans that cater to lower-income people, as well as partnerships with 56 grass-roots organizations like the microfinance institution Grameen. These well-established community partners, some of which have worked for decades in Bangladesh, “have the trust and confidence of rural people,” said Zubair K. M. Sadeque, senior energy specialist at the World Bank in Dhaka. They also “have huge clientele so they already have outreach in rural areas to distribute this technology very quickly,” explained Formanul Islam, Idcol’s deputy chief executive until last year (he is now chief executive of the Bangladesh Infrastructure Finance Fund). Indeed, Bangladesh is considered the birthplace of microfinance. The most densely populated country in the world, it is relatively small, making it easier and more efficient to reach people on the ground. About 88 percent of customers pay off their solar equipment on time. Idcol helps its partners train technicians, maintenance staff and consumers. It also handles financing from international development partners, payment plans and quality control on equipment. More than 150 Idcol staff members conduct random checks across the country to ensure that solar systems are properly installed. Partners, who make money from interest paid on loans for solar installations, are responsible for marketing, sales and collections. High-quality standards and rigorous inspection and monitoring processes are critical, said Mr. Sadeque of the World Bank, who praised Idcol’s “market-based and performance-linked incentives” and professional staff. Idcol also offers products that low-income people want and can afford. Sixty percent of its solar customers buy the smallest panel, which generates 20 watts — enough to power two to three LED lights and a cellphone charger. Some customers with larger homes, like Mr. Ali, pay for more solar panels. After a $20 subsidy funded by Idcol’s international development partners, customers pay installments of about $5 a month, including interest of 12 to 15 percent a year. Idcol is a profitable private company, but its renewable energy division has received support from the World Bank, Islamic Development Bank, Global Environmental Facility and the aid agencies of the United States, Germany, Britain and Japan, among others. Subsidies for solar have dropped over the years, from $90 for a solar system in 2003 to $20 now for small installations. Solar panels are warrantied for 20 years, and batteries for three to five years. Seventy-five percent of the panels are made in China with the rest by Bangladeshi suppliers; nearly all the batteries are locally made. By contrast, the home solar market in neighboring India has seen slower growth because of fragmented financing plans, uneven service after sales, and technical weaknesses in batteries and solar lamps. The Indian market also faces diverse and different conditions from state to state, ranging from language to geography. Mr. Ali’s solar installation was facilitated by TMSS, a local nonprofit that does work with microcredit, health and small enterprise, such as agriculture and handicrafts. Abu Sayed, a TMSS manager, remembered that early on it was difficult to convince customers that the solar panels worked. But the nonprofit’s history of working in the area, and Idcol’s emphasis on quality and post-sale maintenance earned people’s trust. TMSS has six loan officers who cover a six-kilometer radius by bicycle. The unit manager visits customers by motorbike. Close connection to customers and the ability to reach them have paid off. As of the summer of 2015, TMSS had installed more than 600 solar units in this village. Loan repayment rates in the area were 98 percent. However, Idcol has hit some bumps. Solar installations have dropped from 90,000 per month a few years ago to 55,000 per month last year, as counterfeit and lower-quality solar products entered the market. To protect its brand and solar’s reputation, the company began ad campaigns warning customers about copycats and poor quality, Mr. Malik of Idcol said. Political upheaval in this turbulent country can also make it difficult to collect monthly installments. Another threat is natural disaster in cyclone-prone coastal Bangladesh. However, many of the small solar panels are detachable and can be put indoors during bad weather. Idcol also has a disaster management fund to help customers affected by cyclones. And with rapid growth has come a shortage of technical staff and high turnover at grass-roots partners, as technicians jump to other organizations with higher salaries. Still, those challenges aren’t curbing the appetite for solar energy in Bangladesh. A stone’s throw from Mr. Ali’s solar-paneled house, Jahanhiger Alam Joy stands inside his tiny store made of wood and corrugated metal. In the intense summer heat, sweat streams down his face. Mr. Joy looks enviously at his neighbor’s roof. He says he also wants a solar panel so he can run a fan. Amy Yee (@amyyeewrites), is a former correspondent for The Financial Times who has written for The New York Times, The Economist, The Wall Street Journal and NPR.